I’m not a picky eater at all but I can easily get tired of the same old very quickly. I like learning how to cook new things and bravely trying out new recipes. I used to hate when my mom went off the beaten path and tried an obscure recipe we had never had before at home, but now that I’ve got my own kitchen, I’m quickly becoming like her. I am especially brave when I’m the only one eating, so tonight, I revved up my computer and started looking at recent pins on my food board. Starch after starch after starch showed up, and it was all covered in cheese. Wow, I’m such a pasta, cheese, and potato lover! I found a few recipes that looked awesome and then went to the fridge and cupboard. Three bags of little red potatoes and box after box of pasta. Well, I guess that’s a sign! I decided to make two recipes, no matter how unhealthy they both are. 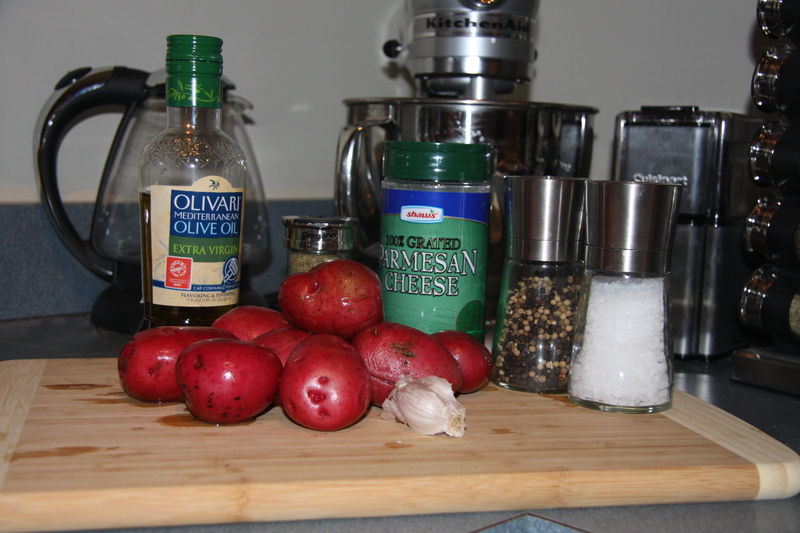 Garlic, potatoes, olive oil, oregano, salt, pepper, and parmesan cheese. Since it was just me tonight, I split the recipe in half and still had tons of extra. Follow Chow.com’s good instructions for putting this together. I jumped right into both recipes at the same time but right then, one of my good friends I hadn’t talked to in while called and I answered (thank you, iPhone headset!). I stirred and flipped the potatoes, and boiled the water for the noodles, and cooked the noodles, and mixed up the alfredo sauce…. and talked and talked…. About 10mins too late I took the noodles out of the pan to drain them and they were pretty gooey. Yeah, I left them in double the time they needed, but it was all okay. They tasted fine, but they were stickier than necessary. 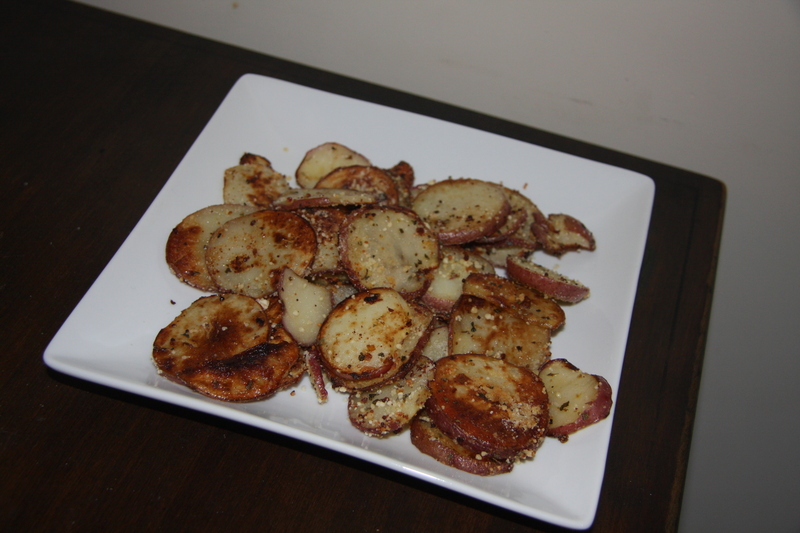 The potatoes took a little while to get soft, but they got crispy quickly. Just pay attention to them if you try this recipe. 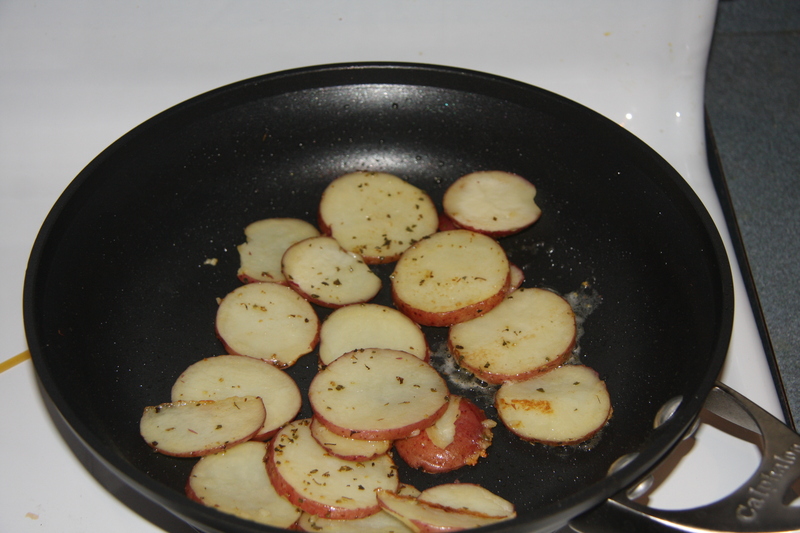 It’s super easy and requires very little prep time (just slice the potatoes!) but don’t get on a long phone call when you’re cooking them. Why did I pick two recipes with Parmesan cheese? Well, because it’s delicious and I will enjoy all the leftovers! Both of these recipes were good. I’ve had better potatoes for sure but the Fettuccine was awesome. The noodles could have used less cook time and just a bit more sauce, but I didn’t follow the recipe that closely since I halved it. I also added chicken to my noodles which probably absorbed a lot of the sauce. 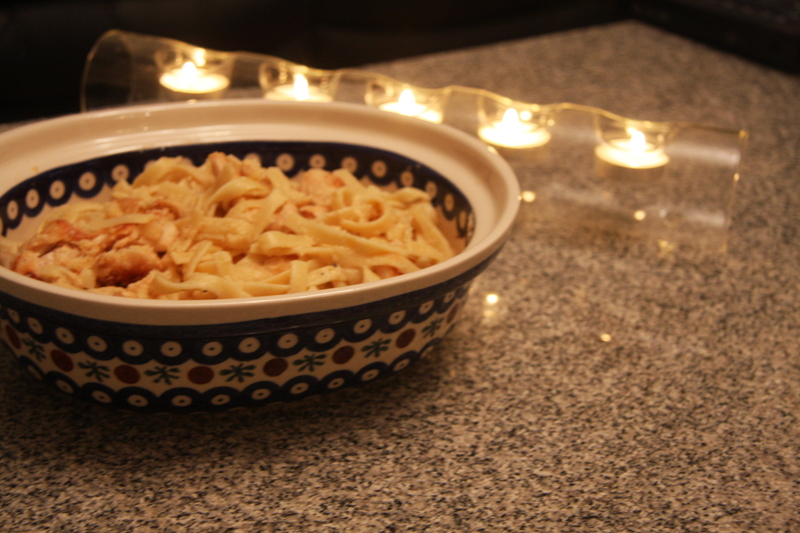 However, for a night to try out some new recipes: Delicious and fun! 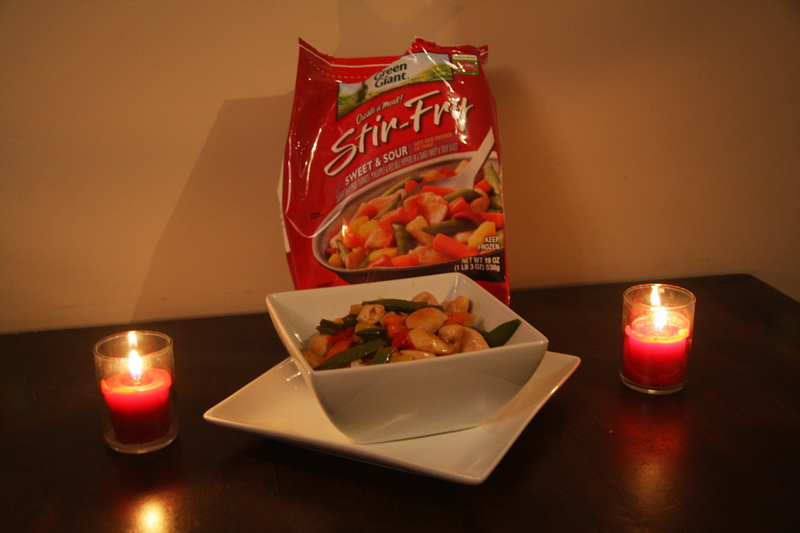 What are some of your favorite meals to cook? I went grocery shopping today and decided to venture down the freezer aisle for some reason. I don’t like buy too many frozen items because I always end up finding a tub of all-too-tempting ice cream, and it somehow finds its way into my cart. Today however, I dodged the ice cream section and browsed the stir-fry options. You can’t beat meals that take this little prep time! Yes, maybe you may say this is cheating…. because it is, but I don’t think there’s anything wrong with a bag of frozen vegetables every now and then. 🙂 And since the husband isn’t home, I have enough left over for lunch tomorrow and dinner tomorrow night! What are some of your easy go-to meals that you might feel are cheating?